You’re back to your usual posting rhythm. Congratulations! A) The sound [k] turns into a velar fricative in a relaxed, familiar style. B) There is overlapping in careful speech. C) The [k] is audibly released by pedantic newsreaders. In my local speech, “acto” is pronounced [ˈatto], with a geminate dental [t] (It sounds very funny). dialect no release at all (indistinguishable from *dialeck; empty no audible release; knocked no audible release; postcard elided; football glottal stop (which I only use for /t/ in particular contexts like this one); gold coin no audible release — by the way, do people really omit [l]? advance has masked [dv] in the onset; success masked but divided between the syllables; first stop elided; friendship fully elided no matter how lento the speaking rate; exercise masked but divided between the syllables; bright sky glottal stop. Completely vocalizing /l/ between a long vowel and a consonant like that is common in some Westcountry accents, where "gold" would be pronounced something like [ɡʌu̯d] or [ɡɔu̯d]—coincidentally very like the pronunciation of its Dutch equivalent "goud". ...which doesn't alter the fact that the textbook author made a mistake in omitting the /l/ in gold. If there were truly "no release at all" of the [k] in dialect your tongue would still be pressed against your velum blocking the air flow, and you would have been unable to breathe ever since. So I don't buy this. No coronal release, was my meaning. I wonder if the author of the book might have missed another case of incomplete plosion (sic). 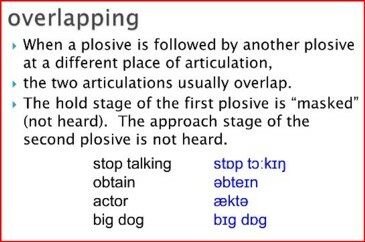 When a plosive is at the end of a word (and followed by a pause), then there is no audible release? I am just thinking of us Italians who are renowned for adding a vowel at the end of all words, just because we make an audible release.